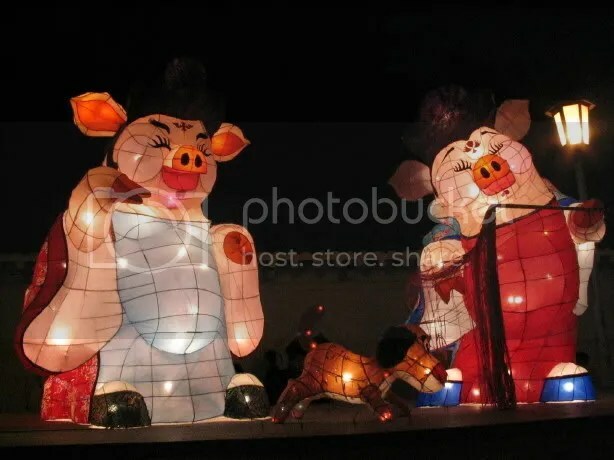 Learning more about the student competition of the lanterns, I found out that my favorite display, up against colleges and elementary and middle schools, was a high school display that won first prize! Credit goes to my cousin for spotting the angle and capitalizing on the sign thingie to put the camera on. I contributed my journal to the process, and did the final fiddling with the camera. 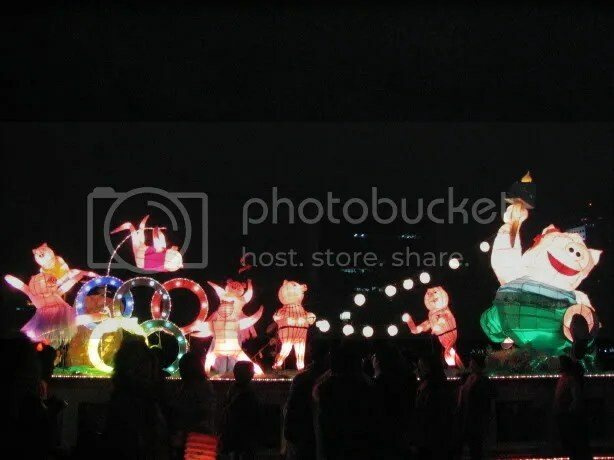 A little hack I’ve discovered for taking night shots is to set the self-timer for two seconds mode on so that it doesn’t get the press-the-button wiggle. The concert hall (or is it the theatre?) I always mix them up unless I’m in one. 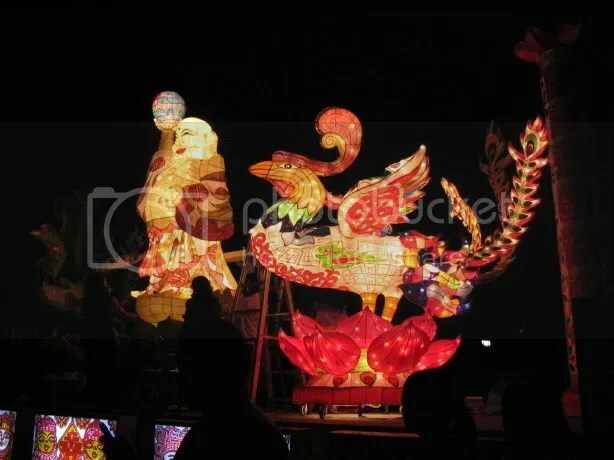 It is raining rather heavily outside, but it was clear and dry when we sent our wishes into the sky in Pingxi tonight. 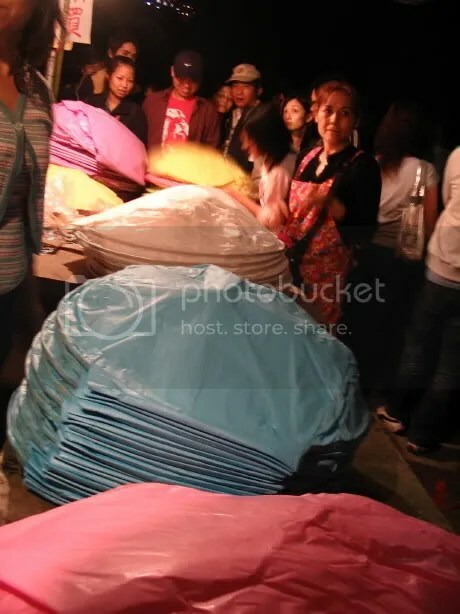 I hadn’t realized that sky lanterns are so enormous, but they are about as big as I am. 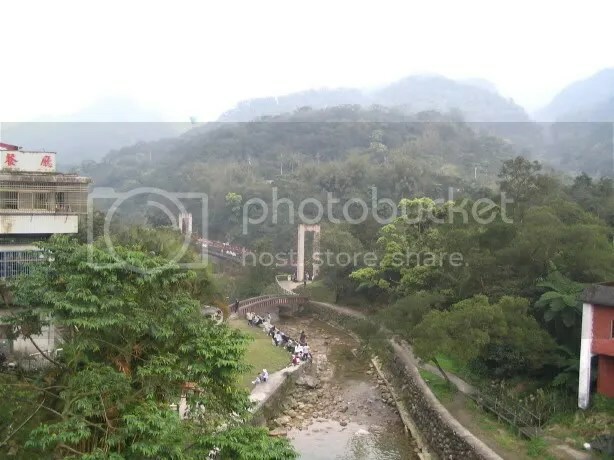 We braved tons of people crowded onto trains to go to Pingxi, and it was completely worth it. 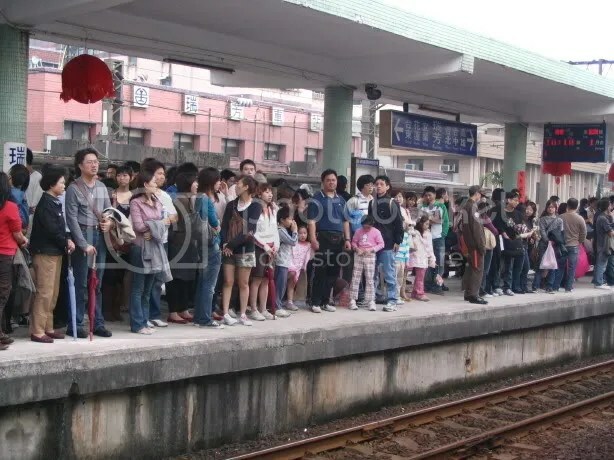 We were standing on the stairs waiting to get onto the platform to change trains before we gave up and went to find a taxi instead. 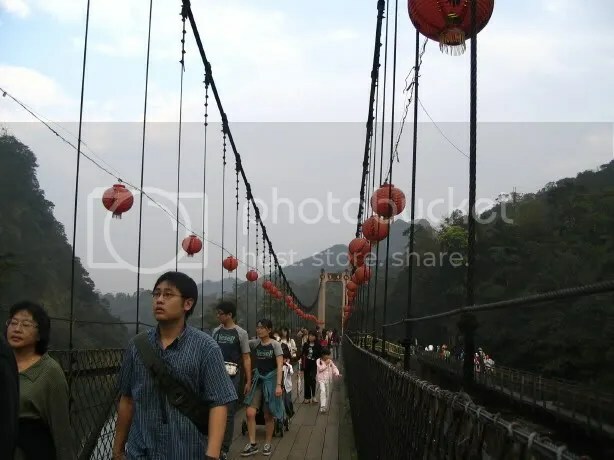 First, we walked across a rather wobbly suspension bridge. 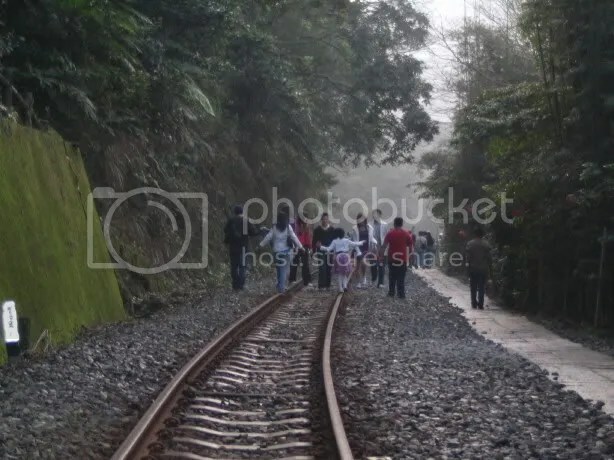 Then, we walked on the train tracks to see the highest waterfall in Taiwan. My cousin grabbed me the large leaf of a taro root to serve as my umbrella, which I was very glad of on my return home. 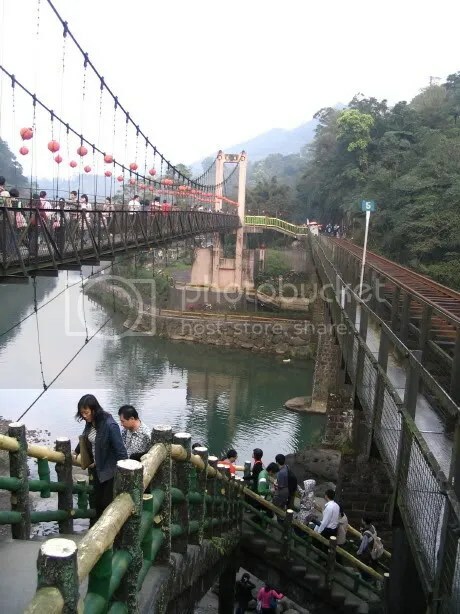 Then, we went into Pingxi as the first firecrackers and sky lanterns were taking off. 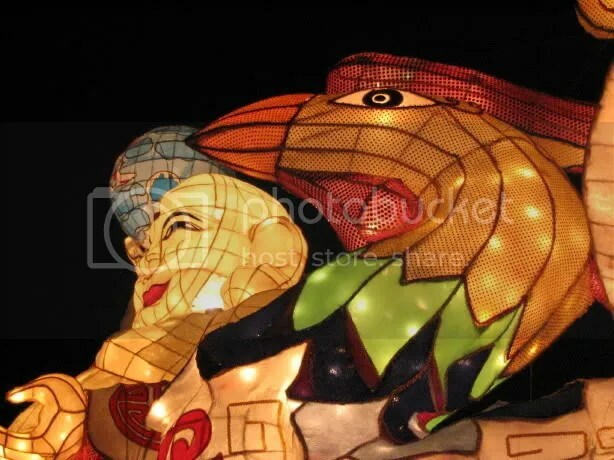 There are lanterns of many colors. Red is for celebrations. Green is for Growth. Purple is for Opportunity. Pink is for Love. White is for Health. 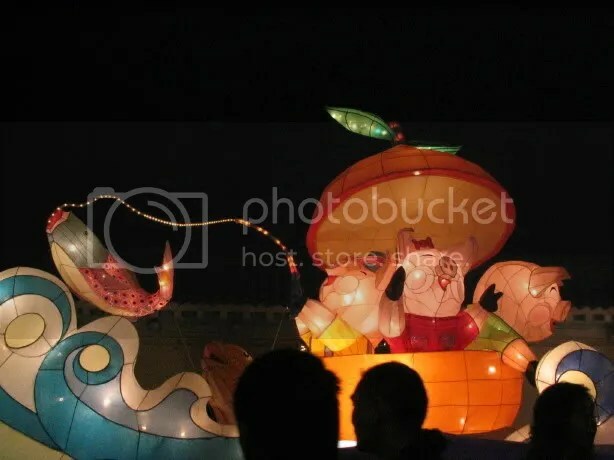 There are also blue and orange lanterns, but I never found out what wishes those are supposed to be for. 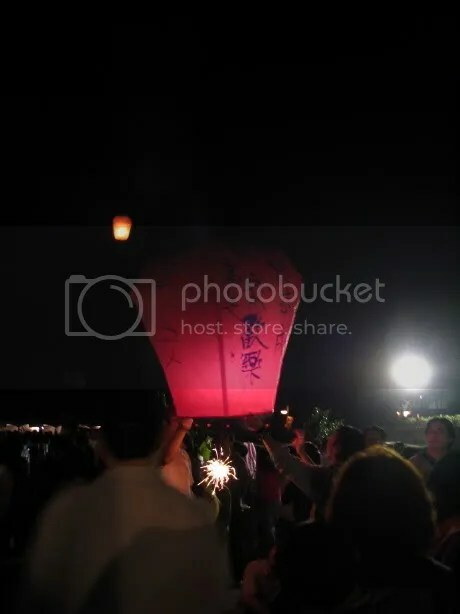 We got four lanterns and painted them with our wishes. 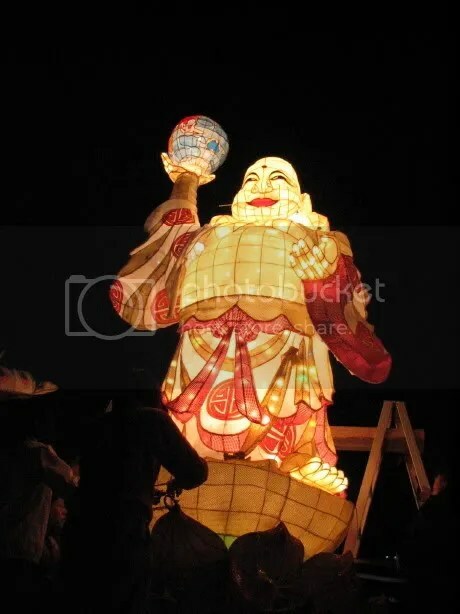 There was a packet of oily paper money to put inside each lantern. You’re supposed to separate the leaves of paper and kind of rip and wrap them around the center of the frame. 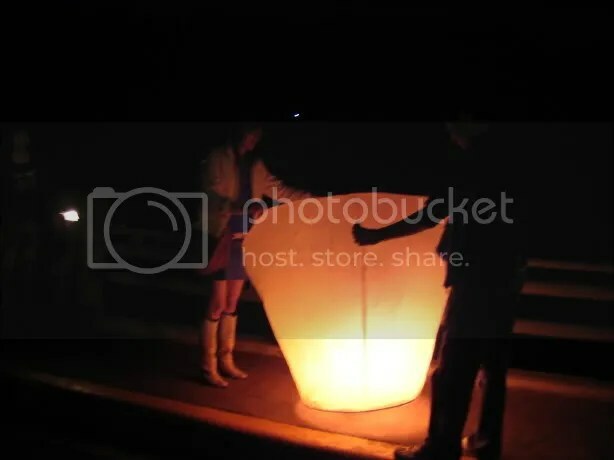 With someone holding the lantern, you light it with a lighter. 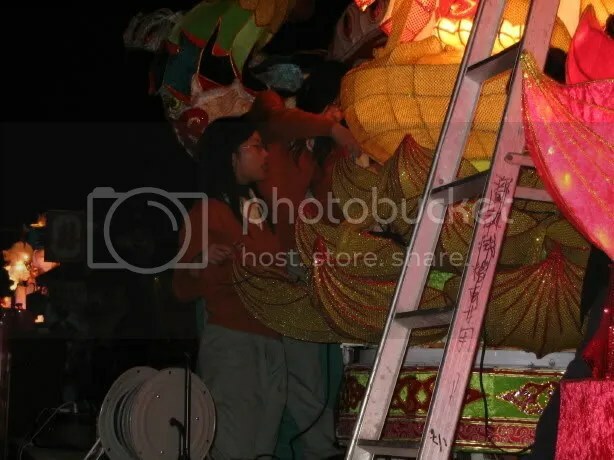 The whole lantern begins to glow and get hot and tug off of the ground. 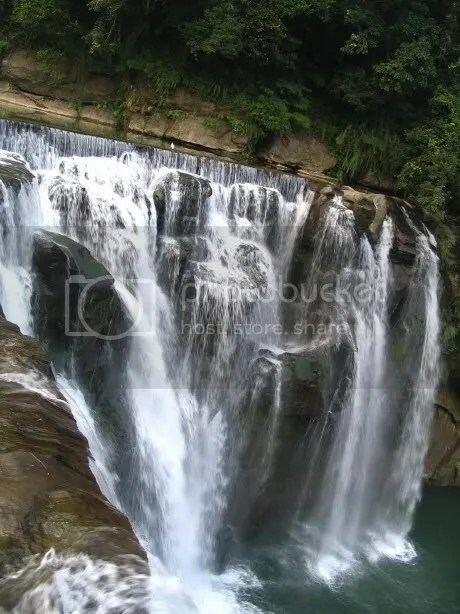 You let go, and it lifts, some fast, some spinning, higher and higher and within a minute, it’s as if you’ve sent a star off to the sky– a tiny burning bubble of hope. My cousin told me that one popular wish was to win the lottery. I wished for my students to grow into thoughtful, caring, wise adults, for my family and friends to be happy, for peace, and for a wedding and family reunion involving dancing and singing. Letting go of each lantern feels so wonderful– it’s warm and lighter than air, bringing your wishes up to the heavens next to the slow-rising full moon. We were at the train station when the rain began. 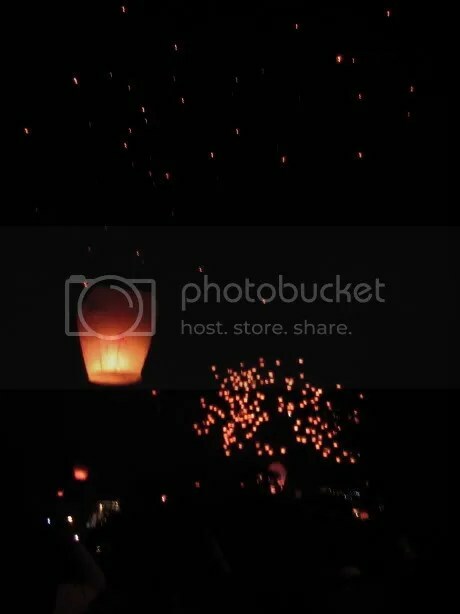 In spite of the rain, you could still see lanterns floating up through the air. 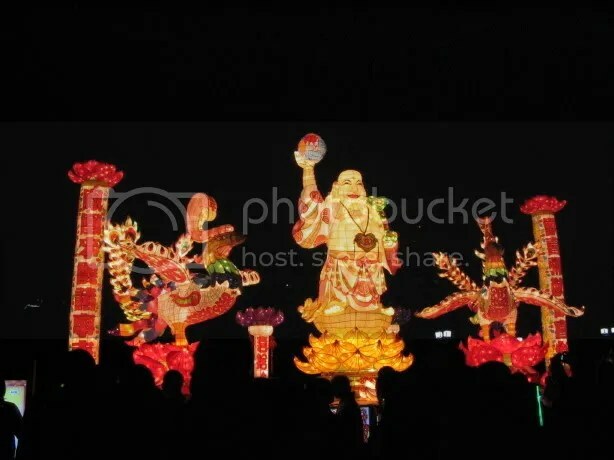 After looking at these videos on YouTube from last year, I wish I’d thought to take some video– but I was just too thrilled at the sight of all those lanterns to remember things like that. 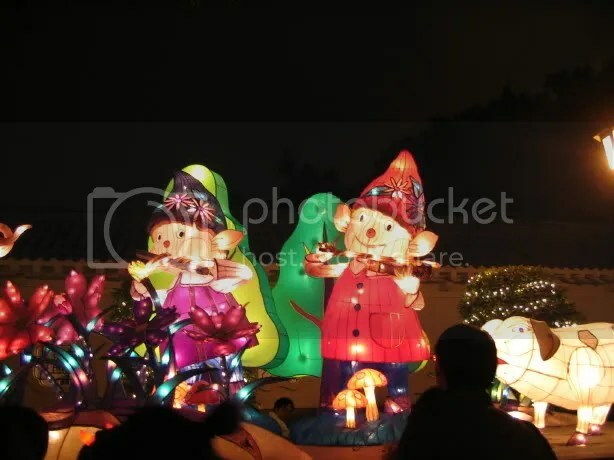 This blog has more about Lantern Festival Celebrations in Taiwan, including the traditions down South where they shoot fireworks directly at people. 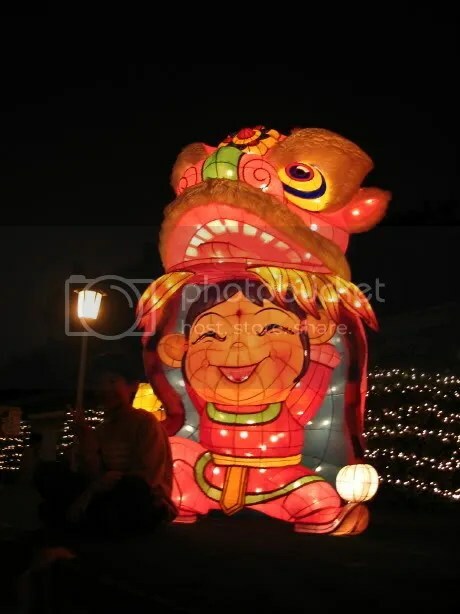 More about the Lantern Festival Traditions here and Pingxi’s Sky Lanterns. 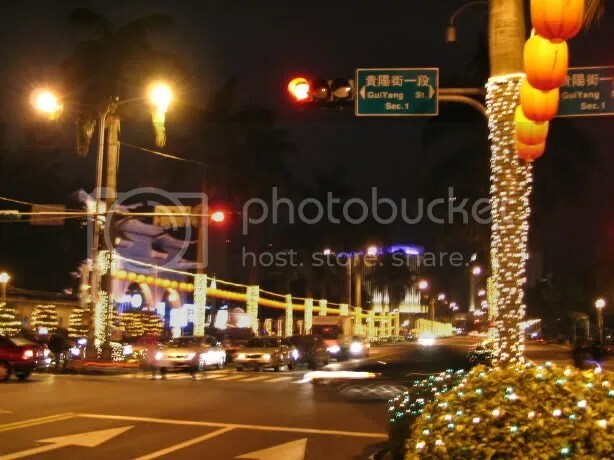 I really missed Christmas and Christmas lights in December. It was my first Christmas away from home. 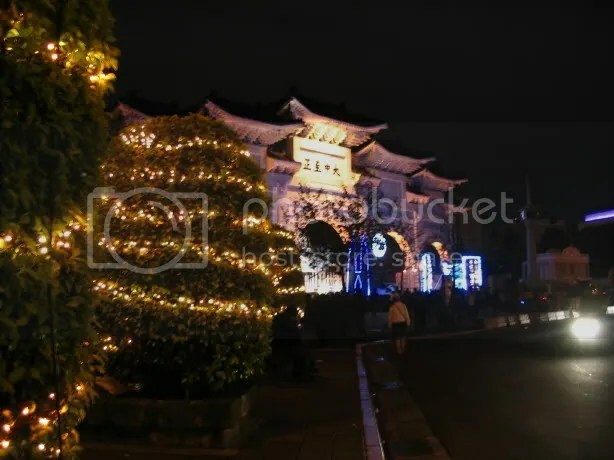 However, on the way to the Chiang Kai Shek Memorial going from the 228 Memorial, I realized that Taipei probably needed to save all that electricity for the Lantern Festival. 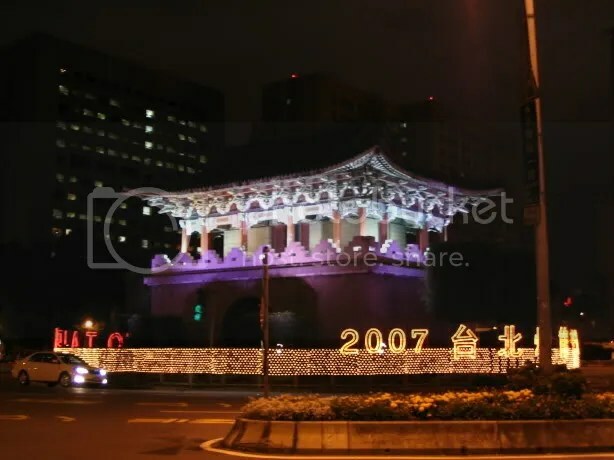 In front of the gate, there were odd tourist sort of displays “Love Hong Kong!” and streams of people wearing glow-in-the-dark devil horns, wielding light sabers, and various other glowing things. 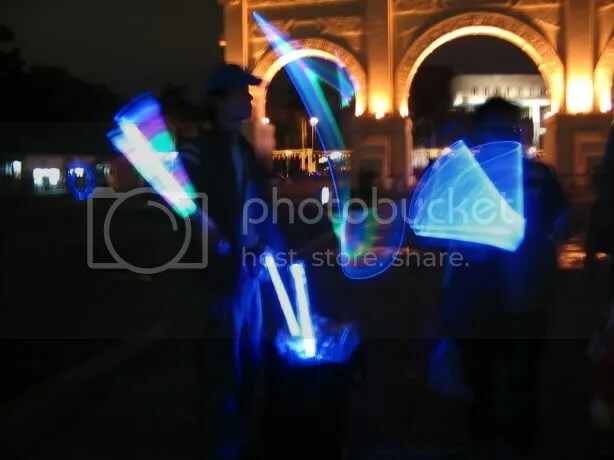 I love the light-saber movement caught by the long-exposure here. 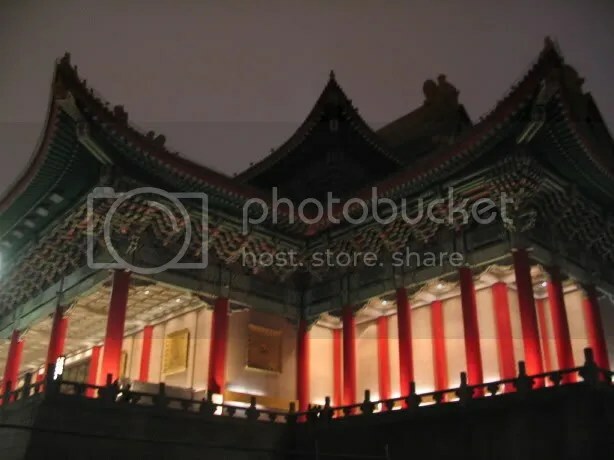 (Taking photos in the dark proved to challenge my skills as a photographer– but I learned to love the manual setting of my camera and the delete key). 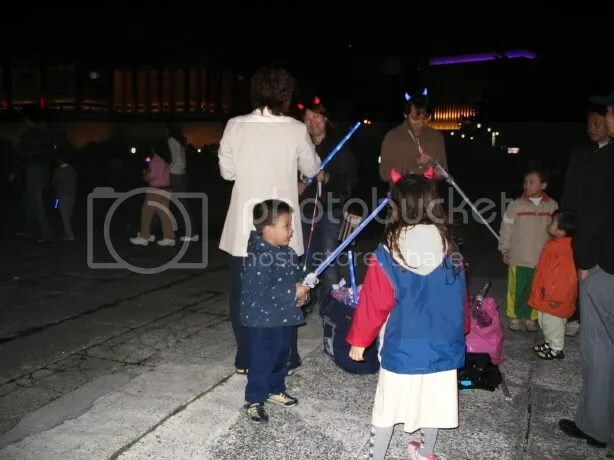 Little kids were walking around carrying light sabers bigger than they were and some also swung about little hand-held lanterns. 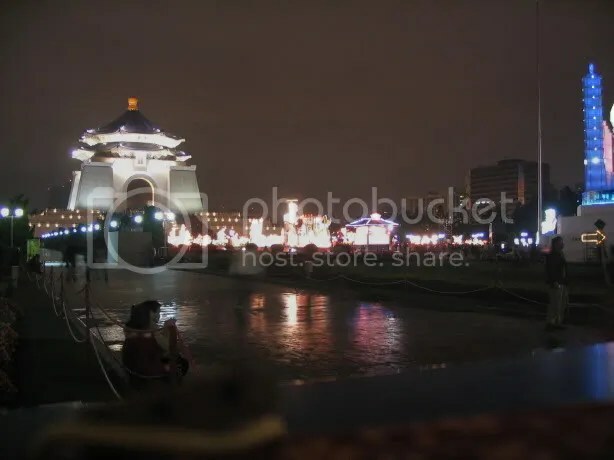 There are a couple of stages set up outside the National Concert Hall, and in front of the CKS Memorial, there were lantern floats in the process of construction and testing. 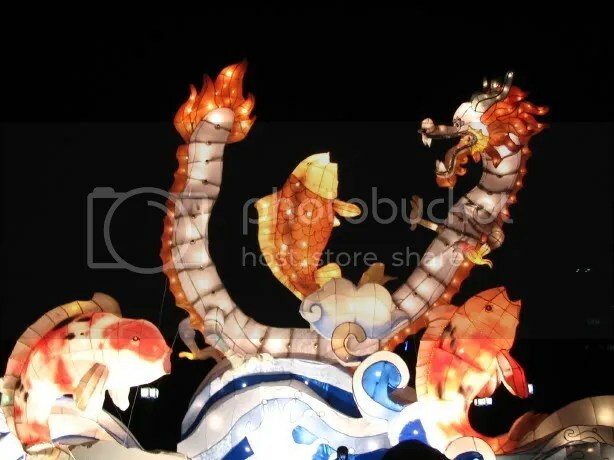 This student float was mostly finished– it’s a carp jumping over a dragon– they sort of swayed in the breeze, which was pretty cool. I thought this one was completely awesome– and it’s not even finished yet! I really wish that we could have had making something like this as a school project when I was in high school or in college for Asian Awareness Week. 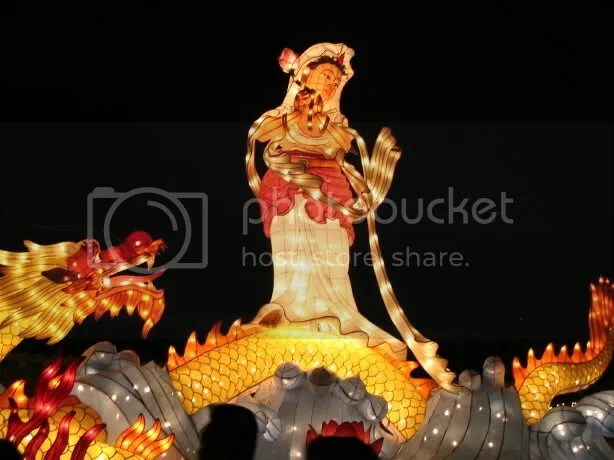 Actually, I’d love to learn how to make a lantern now– they’re so pretty! I have to say, it was odd going to the festival where all was light and music and partyish, when just a few blocks away, I’d been contemplating the innocent deaths of thousands of people caused by the very person honored by the CKS Memorial. It was closed when I got there, the steps serving as seats to people looking out on the avenue of lantern floats, and the balconies secluding canoodling couples.